John McGuinness will once again have the honor of leading the way as the 2012 Isle of Man TT fueled by Monster Energy bursts into life. The 17-times TT winner has been given the number one plate, meaning he will be the first man down Bray Hill when the first race, the Dainese Superbike, starts on June 2. Although the 2012 TT features an incredibly strong line-up, the Morecambe star once again starts as favorite for victory in the Superbike and PokerStars Senior TT races. It has been confirmed 86 riders will start qualifying with 70 start places up for grabs. 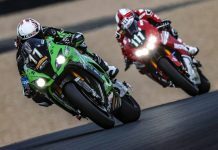 With 56 six riders in the 2012 field already clocking laps of over 120mph in previous years, this could be the first year where the entire field goes over 120mph. There is a new format to this year’s grid positions with numbers 21 onwards starting in qualifying order, but retaining the number allocated throughout race week. The riders with numbers one to 20 will remain in that order. Following McGuinness, at number two, will be multiple Duke Road Race Rankings champion Ryan Farquhar. In 2011 the KMR Kawasaki rider was forced to sit out four of the five solo races due to injury, so will be eager to get back to the forefront this time around. Chasing McGuinness will certainly give him a good target to aim for as he seeks his first ever 130mph lap, but he’ll also have a major contender for honors hunting him down with Guy Martin on the Tyco Suzuki retaining the number 3 plate. The Lincolnshire rider again came close to that elusive first TT win in 2011 and will be hoping that if he notches his 14th podium, it will finally be on the top step. Australian Cameron Donald has opted to go at number 4 again, having competed there in a number of races last year. The Wilson Craig Racing rider is always a contender for honors on the Isle of Man, but will need to up his pace if he’s to emulate his Superbike race win in 2008. Fellow Antipodean Bruce Anstey has started at number 5 for many years and will again be there at TT 2012 with the Padgetts Honda ace looking to repeat the form he showed 12 months ago when he challenged McGuinness in both the Superbike and Senior races. He’s yet to win a premier Superbike race win on the Island, but after lapping in the 131mph bracket, he’s well placed to put that right. Starting behind Anstey at number 6 will be 2010 record breaker Ian Hutchinson, finally getting the chance to race his Swan Yamaha’s around the Mountain course. Recovering from a second broken leg, you’ll be hard pressed to find a more determined rider on the grid in 2012 and, if he’s fully fit, Hutchy has a great chance of adding to his 8 TT wins. Another potential race winner, Gary Johnson, starts behind Hutchinson at number 7. Johnson, now on the Padgetts Honda, took third in last year’s Superbike race and will fancy his chances of going two better and adding to last year’s Supersport win. Northern Ireland Stalwart Adrian Archibald goes at number 8, just ahead of fellow countryman Michael Dunlop who, after a long winter, lines up with a formidable team behind him. With the potential to dominate race week, the 24-year-old will be confident on the Hunts Motorcycles Honda Fireblade. If he can show the form he did in the Superstock race last year, he’ll certainly be challenging at the top of the leader board. Completing the top 10 for the third year in a row is Manxman Conor Cummins. The Ramsey man, now back to full fitness, will be hoping to serve up a repeat performance of 2010 when he comfortably led the Superbike race. The fastest rider from a standing start, Cummins will be Tyco Suzuki-mounted in 2012, with the factory backing sure to help him in his bid to achieve his maiden TT win. After spending the last few years at number 13, race fans will have to get used to Dan Stewart carrying the number 11 plate as the Wilcock Consulting rider deservedly moves up the order after a succession of top six finishes in the last three seasons. Michael Rutter returns, this time on the Batham’s Kawasaki, at number 12, just ahead of two other Kawasaki riders, James Hillier and Ian Lougher. Hillier takes the number 13 plate and has already indicated he’s looking to join the 130mph club and crack the top six, while Lougher, now in his 28th year of racing at the TT, can be relied upon to put in some solid performances. William Dunlop starts at number 15 and no doubt race commentary will have to wait until he passes through the various timing points before announcing the leader board, and the same can be said for Dan Kneen, the Marks Bloom Suzuki rider starting 10 seconds further back at number 16. Simon Andrews, best Newcomer at the 2011 TT, is rewarded with a good start number of 17 on the second Honda TT Legends machine, while the returning James McBride, Mark Miller and Davy Morgan complete the top 20. Qualifying will determine the remaining start positions on the grid. In practice, German Rico Penzkofer will carry the number 21 plate while another leading European rider, Portugal’s Luis Carreira, will have number 22. The JMF Millsport Ducati Panigale of Steve Mercer will have the number 24 plate and other leading privateers to look out for include Ian Mackman (26), John Burrows (27), Stefano Bonetti (29), Paul Shoesmith (30) and Mark Buckley (31). Exciting Australian rider David Johnson, fastest newcomer in 2010, returns at number 32 after missing last year, with fellow returnee Kiaran Hankin at 33. Regulars Rob Barber, Russ Mountford, Paul Owen, Stephen Thompson and Daniel Cooper will be next in the race guide. The overseas challenge is again well represented with Spain’s Antonio Maeso, South African Hudson Kennaugh, Hungarian Sandor Bitter, Herve Gantner from Switzerland and Italian World Supersport podium finisher Alessio Corradi all in the top 60 starters. Fabrice Miguet from France, American Brandon Cretu and Japanese rider Yoshinari Matsushita will also attract international fans. Jenny Tinmouth is back for her third TT seeded just behind one of the most welcome returnees Olie Linsdell, who missed last year’s TT. Newcomers to look out for include Jamie Hamilton, Alan Bonner, Lee Johnston, John Ingram and Karl Harris. Meanwhile, riders moving up from the Manx Grand Prix include the Northern Ireland trio of Shaun Anderson, Ryan McCay and William Davison. Paul Phillips (Isle of Man Government TT and Motorsport Manager) says: “There’s no doubt that we are now seeing the benefits of the event’s increased profile and the rider recruitment program with the strongest field in living memory. “You can throw a blanket over the front of the field and any one of the top 10 could win the race and any of the top 20, on their day, could reach the podium.